Alexandra Tompkins joined Carol’s Kitchen as our executive director to manage day-to-day kitchen activities and to serve as the chief operating officer for the board of directors. She notes that her “full name” is Emma Alexandra Tompkins, making her initials “EAT,” which she calls “very appropriate” because she loves to cook for people. We talked to Alexandra this past week about her new role and what inspired her to work for Carol’s Kitchen. How did you get involved with Carol’s Kitchen? I heard about Carol’s Kitchen and Carol’s story touched my heart. I started volunteering at the Banning kitchen in May 2014. 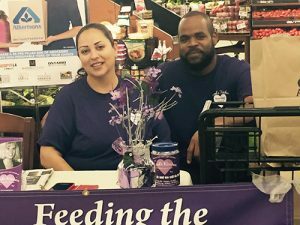 A few months later, in August, I heard Cabazon needed a cook and since I love to cook, I went to see if I could help. I became the cook on Mondays and Thursdays and soon after, became the kitchen manager. Eventually Banning needed a cook for a few months so I started cooking Tuesdays and Fridays and helping as a kitchen manager as well. What inspired you to work for a soup kitchen? When I was about 5 years old my dad took me to a soup kitchen in Fresno called Povorello House. It was my first memory of seeing people in need and since then, always felt in my heart that I wanted to help somehow. When I first started volunteering, I wanted to see what I could do for others. However, I soon saw what others were doing for me by showing me such incredible hard work and dedication. I also saw the transformation some people went through while serving others or coming as a guest to our kitchens. I was amazed. Tell us about your new role as executive director. I have been the executive director for Carol’s Kitchen for a little over a month. I’m very excited about the direction in which Carol’s Kitchen is going and really look forward to the future. We’ve experienced a sudden growth in our kitchens with our guests. More families dealing with food insecurities are growing in numbers. Our job is to make sure we’re able to take care of the people in our communities so that these children and adults don’t go hungry. Talk about how your family is involved too. My husband Roy and our five children have all volunteered and share my love for what we do. I really have the support of my husband and kids, which I truly appreciate. I’m also grateful to the many volunteers who have shown me what Carol’s Kitchen is all about!